Walter C. Whitaker (1823-87), Brigadier General, USA (Kentucky). Participated at Shiloh, Murfreesboro, Chickamauga, Chattanooga (WIA), Atlanta campaign, Franklin, Nashville. 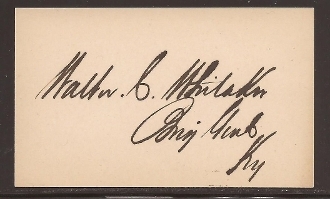 Card Signed (CS) with rank as Brig. Genl., Ky.